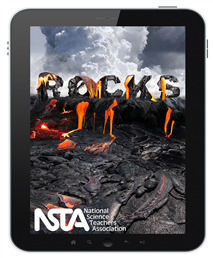 Digital resources are stored online in your NSTA Library. Different rocks have different mineral compositions and different textures. Observing and documenting these differences provide insight into a rock’s larger geologic context and natural setting. Observations of rocks can tell us about the processes and the environment in which they formed, giving us clues about the composition and age of Earth. The Rocks Enhanced E-book* explores different kinds and categories of rocks, the major processes through which they form, and the cyclical nature of the formation and transformation of rock materials. The focus is on topics related to the rock cycle as part of the transfer and transformation of matter and energy in Earth’s system as well as a sense of the time scales involved and how rocks provide information about their own development and the history of Earth. *Enhanced E-books are highly interactive, self-directed learning experiences designed to augment understanding of science content and pedagogy. These e-books include high-resolution images, animations, videos, interactive simulations, and embedded assessment. To view this book in a browser, go to ereader.nsta.org and log in.